"Dear Ashley, I thought I would drop you a line to say how impressed I am with the work you have done for us. The refurbishment of our ancient website is brilliant, you soldier on from year to year with the same design & content without realising how stale it has become - it is now a breath of fresh air and a joy to navigate. You have recently completed a 'customer area' for us which is private to our clients which is already receiving positive feedback. It is simple to update the content and our customers are automatically notified of the changes. Well done, I am very pleased"
We were asked to develop a new website for East Anglia's foremost independent security installer. 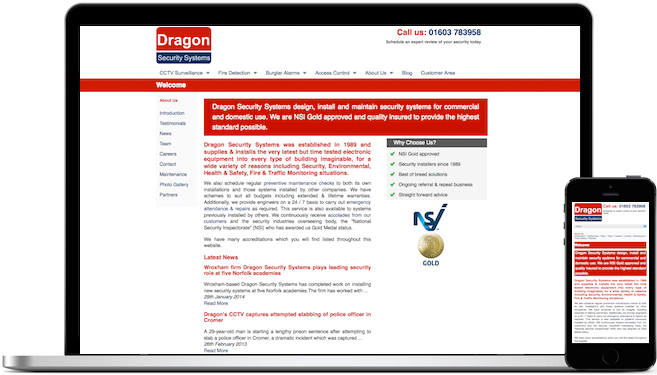 We were approached by East Anglia's foremost independent security installer to re-design and re-structure their website and develop a secure password-protected 'customer area' to distribute documents / updates. We started with analysis to understand the different market segments the website needed to address and a collection of user journeys to understand what each segment is looking for. The new website is split into four main areas based on the type of installation / service the company provides. The new website also provides news articles, staff profiles, and helps in recruitment of new employees. In 2015, we updated their website to be responsive so the layout adapts automatically to different size devices such as phones and tablet.